Howard University is a four-year, comprehensive, private, coed liberal arts university. It was found…. Howard University is a four-year, comprehensive, private, coed liberal arts university. It was founded in 1867 to train black teachers and ministers to guide and teach the 4 million freed slaves and 25,000 free-born blacks. The school was first called Howard Normal and Theological Institute for the Education of Teachers and Preachers, named after General Oliver Otis Howard, one of the founding members and commissioner of the Freedmen’s Bureau. In 1867, the school was named Howard University in recognition of the much broader educational scope envisioned for the institute. That same year, the University was officially incorporated and chartered. The University’s designated departments were normal and preparatory, collegiate, theological, medical, law, and agriculture. In 1872, the first bachelor’s degree was awarded. Integrated since its founding, Howard University’s first students were 4 Caucasian women who were daughters of 2 of the University’s founders. Today, Howard University has an international blend of faculty members and students as it continues to embrace and enhance the founders’ vision to provide an educational experience of exceptional quality to students of high academic potential, with particular emphasis upon the provision of educational opportunities to promising black students. Now a private institution supported by the federal government, corporations, foundations, and individual contributions, Howard is recognized as one of the few comprehensive predominately black institutions of higher education in the world. The seventeen schools and colleges incorporate the original intent of the founders with contemporary, relevant topics in 200 subjects. Howard University has more than 50,000 alumni, and has produced more than 10 percent of the nation’s black doctors, lawyers, business leaders, politicians, social workers, engineers, artists, musicians, and other professionals. Five national Greek-letter sororities and fraternities were founded and incorporated at Howard University, including Alpha Kappa Alpha Sorority (1908), Omega Psi Fraternity (1911), Delta Sigma Theta Sorority (1913), Phi Beta Sigma (1914), and Zeta Phi Beta (1920). Howard students are often in the media spotlight for events such as division championships or for demonstrations for improvement of federal financial aid to the campus. Howard University is located on four campuses in Washington, D.C., and suburban Maryland. The 89-acre main campus houses 65 buildings, which include a theater, a -million, 500-bed teaching hospital, and a 110-room hotel used for the hotel management program. The newspaper office is located in the house where Charles Drew once lived. The main campus is 5 minutes from downtown Washington. The hilly 22-acre west campus near Rock Creek Park houses the Howard Law Center. The 108-acre School of Life and Physical Sciences is located in Beltsville, Maryland, and the 22-acre School of Divinity is located in northwest Washington, D.C.
Howard is accredited by the Middle States Association of Colleges and Secondary Schools (MSACS) to award the Bachelor of Arts, Bachelor of Science, master’s, and doctorate degrees. Percentage of students receiving financial aid: 76 Financial Aid Specific to the School Army, Air Force, and cooperative Navy ROTC provide training in military science for commission as second lieutenant or ensign in the armed forces. Scholarships pay tuition, fees, and books and provide a monthly stipend. Students should contact the ROTC Office. SAT or ACT required. Graduation from an accredited high school (or equivalent) with the following units: 4 English (grammar, vocabulary development, composition, literature, analytical reading, or oral communication); 2 mathematics (geometry, algebra, trigonometry, statistics, or calculus); 2 social science (history, social studies, economics, geography, psychology, sociology, government, political science, or anthropology), 2 natural or physical science (biology, chemistry, physics, environmental science, botany, or geology), and 2 foreign language; a minimum 2.0 high school GPA. Students must submit an official high school transcript, and one letter of recommendation. A non-refundable application fee is required. Some colleges or schools at Howard require additional information. Admission Application Deadline: April 1 (fall); November 1 (spring); March 15 (summer) Admission Contact: Dean of Admissions and Records, Howard University, 2400 Sixth Street, NW, Washington, D.C. 20059; Telephone: 202-806-2750 or 2752. A minimum of 127 to 160 credits hours, depending on the major, and completion of core requirement to include 16 mathematics, 16 science, 14 foreign language, 4 physical education, and 1 computer course (for business, economics, mathematics, and engineering majors). The last 30 credits must be taken at Howard; students must have a 2.0 GPA (2.5 in education and social work) and must take a comprehensive examination. Some programs have additional requirements. Total enrollment: 12,000 In-state: 1,459 Other regions: 49 states, 100 international Ethnic/racial makeup: African American, 10,080; Hispanic, 120; Asian, 240; Native American, 112; Caucasian, 224; International, 1,224. Campus Regulations: Alcohol prohibited on campus. Campus Services: Health center, personal and psychological counseling, career planning and placement, and transportation to some off-campus housing. Campus Activities: Social and cultural activities include theater, chorale, concerts, band, jazz ensemble, speaker series, and art displays. A highlight each year is the Spring Festival, which includes dance and music concerts, art displays, and picnics. Howard’s homecoming and crowning of Miss Howard University are events that students and alumni look forward to each year. Students may get involved in the award-winning Hilltop student-run newspaper or the Bison yearbook. 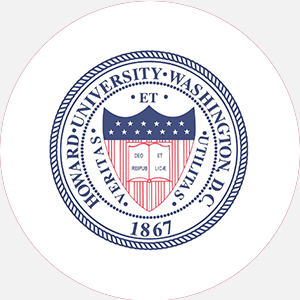 Communication majors may work in the student-run radio station, WHUR-FM, or the college television station, WHMM-TV, which is transmitted throughout the Washington, D.C., area. WHMM-TV was the nation’s first black-owned and-operated public television station. Leadership opportunities are found in the Student Government Association (SGA) or the more than 150 student organizations, including dance and theater groups, sports clubs, and special interest groups such as the Baptist Student Union, Absalom Jones Student Association, Adventist Community, Methodist Fellowship, Caribbean Student Association, African Cultural Ensemble, and Pan African Association. Greek Life: Fraternities include: Alpha Phi Alpha, Kappa Alpha Psi, Omega Psi Phi, and Phi Beta Sigma. Sororities include: Alpha Kappa Alpha, Delta Sigma Theta, Sigma Gamma Rho, and Zeta Phi Beta. Other Greek organizations recognized that are non Pan Hellenic include; Alpha Phi Omega, Iota Phi Theta, Kappa Kappa Psi, Phi Mu, Alpha, and Gamma Sigma Sigma. Honor Societies include: Phi Beta Kappa and Sigma Xi. Housing Availability: There are 5,000 housing spaces: eight dormitories for women, eight for men, and two coed dorms. A block of freshman housing is reserved on first-come, first-served basis; campus apartments and married student housing are also available. For more information, students may call 202-806-6131, 6132, or 6133. Handicapped Services: Most of the campus is wheelchair accessible. Other support services include note-taking, reader services for the blind, and special class scheduling.